Description: A majestic Moose meanders along the shore of a mountain lake while the early morning summer sun rises, creating an image that is perfect for a picture postcard or a great work of art. This ceiling fixture features a stunning Silver Mica shade, which is complemented with decorative accents, frame and hardware featured in a Timeless Bronze finish. 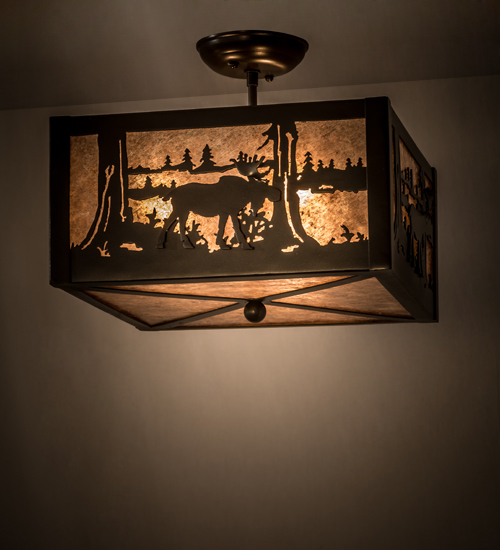 This flushmount is custom crafted by Meyda artisans at the foothills of the spectacular Adirondack Mountains in Upstate New York. Custom sizes, styles and colors are available, as well as dimmable, energy efficient lamping options such as LED. The fixture is UL and cUL listed for dry and damp locations.